The Department of Public Health, along with the national Greater Than AIDS initiative and the Kaiser Family Foundation, recently introduced Speak Out: Let’s Bring HIV Out of the Closet, a social marketing campaign aimed at encouraging men not only to get tested for HIV regularly, but also to speak openly about their status and the disease in general, as a way to remove some of the stigma within the community associated with being HIV-positive. “We understand that there’s been a lot of strides in the gay community, which is incredible. The thing is, though, HIV is still a big part of our community as well. So we wanted to make sure people don’t forget that,” Fuqua said. 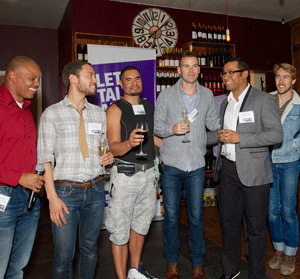 The campaign was introduced October 10 at Blush Wine Bar in the Castro. It will extend to other cities next year. Along with the highly visible billboards in the Castro Muni station, the campaign also includes an online video featuring seven gay men of different ages, races, and statuses, discussing how men are talking about, and dealing with HIV, some three decades after the disease’s initial outbreak. Steve Iberra was one of those men. At Blush, he said that, as an HIV-positive man, he was motivated to come forward and help spark the dialogue this campaign aims to start. “Why can’t HIV be a conversation at the bar?” he wondered. Iberra is an activist who works at City College of San Francisco, and before being asked to be part of the campaign’s video, he had just seen Ryan Coogler’s critically acclaimed film Fruitvale Station , about the shooting death of Oscar Grant, a young, unarmed African American man, at the Fruitvale BART station four years ago by a former BART police officer. He said that seeing the film inspired him to take action to help minorities in the Bay Area. As a “Central American born and raised in San Francisco,” Iberra said, “it’s very important to me that minorities are getting the message” about HIV. Over 50 percent of all Americans living with HIV are gay and bisexual men. In San Francisco alone, men account for 90 percent of all people living with HIV, and 82 percent of all new infections, according to figures from the San Francisco AIDS Foundation. Given those statistics, somebody like Gavin Morrow-Hall, who was also at the event, would not be considered unique. Morrow-Hall, who works for the health department, was married in 1986, and he said, within five years, his husband and his best man at his wedding were both dead. “I’m a big believer in HIV prevention and getting tested regularly has helped keep me negative,” he said. He described getting tested as “cathartic,” forcing a person to reflect on how he or she has been living their life, and how they can change for the better in the future. This entry was posted in English and tagged Aids, Campaigns Against HIV Stigma, HIV, HIV stigma, Speak Out, Stigma by kiumars. Bookmark the permalink.